Travis Cerling started teaching high school science in 1997. He switched to middle school science in 2000. For the past three and a half years, Cerling has been the middle school science coach for the district. “As a science coach, I find new tools, new ways to teach, and share those ideas and tools with the team. I also teach two sciences courses,” shared Cerling. “It really is the best of both worlds. 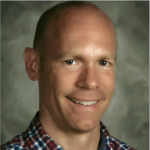 I work with teachers, and still get to be in the classroom with students.” Working with fellow science coach Shannon Lee and the science teachers across the district, Cerling has been instrumental in the effective implementation of common formative assessments at the district’s six middle schools. To learn more about how Cerling and Lee implemented common formative assessments with their science teams, download this Naiku Case Study.